*The six people who were arrested in Iran for dancing in a YouTube video to Pharrell Williams’ song “Happy” have been freed, the International Campaign for Human Rights in Iran said Wednesday, citing a source close to the families. The director of the video, however, was not released, the group said. Tehran Police Chief Hossein Sajedinia ordered the arrests of the three men and three women for helping make an “obscene video clip that offended the public morals and was released in cyberspace,” the Iranian Students’ News Agency reported Wednesday. Authorities forced the young people to repent on state TV. “It is beyond sad that these kids were arrested for trying to spread happiness,” Williams said via Facebook today, linking to a news story on the incident. 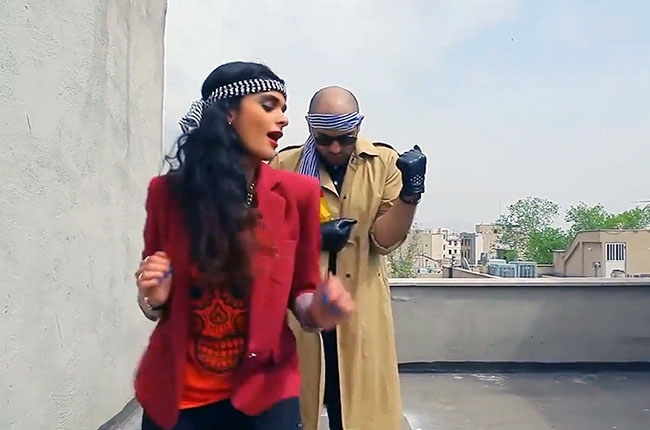 On May 19, the video was posted to YouTube [scroll down to watch], showing a group of young men and women dancing around the Iranian capital of Tehran to Pharrell’s No. 1 hit. What seemed an innocuous, cheerful gesture enraged the culturally-conservative Iranian government. The hashtag #FreeHappyIranians has taken off on Twitter, as the protest went viral. Previous ArticleActress Ellia English performs at Herb Alpert’s Vibrato in Bel Air - Tonite! You just can’t be going around offending people’s morals all willy-nilly. But if the Tehran police chief really thinks his morals were offended by what he saw these people doing, he should attend a BET awards ceremony. That’l learn im’.